AT AROUND 4 pm yesterday, I headed into battle. I climbed into the tank sitting in my driveway (you might call it a car) and ventured out into the hellscape known as Los Angeles traffic. Over the next 90 minutes, I covered 23 miles, a journey marked by creeping gains in ground, honking altercations, and endless frustrations. My average speed was 15 mph, my arrival a pyrrhic victory. And there was nothing special about it. Uber believes it has the solution, one that goes beyond summoning someone to do the driving. Instead of driving my tank or riding in someone else’s, I’d whip out my phone and pull up UberAIR in the company’s app. I’d head to the roof of the nearest tall building and hop into the gleaming white helicopter-drone hybrid thing waiting there to lift me up and over the traffic at 200 mph. Yes, Uber wants to offer flying cars. It went public with this hope a bit more than a year ago, and since then the idea has only gotten more serious. It has made deals to run some kind of service in Dallas and Dubai. And this week, Uber announced that, come 2020, it wants to launch at least a few flying cars in Los Angeles, with a real commercial service to follow a few years later. 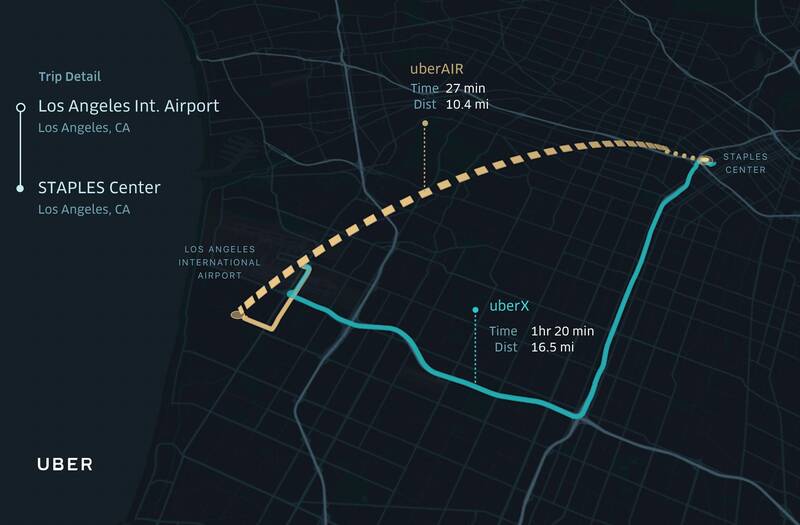 To go with the news, Uber released a video detailing how it thinks this could go. After grabbing an elevator, passengers will tap their phones to pass through a turnstile and access the roof. Presumably they’ve been prescreened, because there’s no airport-style security in evidence. An agent in an orange vest takes a group of four passengers out to the waiting aircraft. There’s a pilot up front, and a small overhead display with the estimated arrival time. Then it’s just sit back, relax, and chuckle at the suckers stuck in the old-timey traffic far below. If, that is, Uber can crack all the problems that come with launching a new sort of transportation service. That means wrangling with air traffic control, finding appropriate routes, addressing noise concerns, and—oh yeah—get its hands on a bunch of flying cars. But here’s the real crazy thing: Uber has a legitimate chance of figuring it all out. From the start of this hard-to-believe journey, the company has insisted it wants to help build an ecosystem that makes a flying service possible. Just as it doesn’t build cars or regulate intersections, it doesn’t plan to design its own vehicles or hire its own air traffic controllers. It wants to be a catalyst, to help others crack those problems, motivating them with a role in what just might be the next big thing in transportation. Integrating a fleet of air taxis into an existing city is an immense, but not impossible, job. For starters, the sky isn’t empty. The airspace over Los Angeles is already full of helicopters, flown by police, news crews, and others. There are six airports in and around LA. “There are airspace questions that arise with having more than just a few rotorcraft vehicles flying around a metropolitan area,” says Seth Young, who runs The Ohio State University’s Center for Aviation Studies. Helicopters can operate with visual flight rules (i.e., keep an eye out for, and avoid, each other), but in a city as busy as LA they must also coordinate with air traffic control. Adding hundreds more vehicles will make that system unfeasible. Uber acknowledges as much. “UberAIR will be performing far more flights over cities on a daily basis than has ever been done before,” the company’s chief product officer, Jeff Holden, said in a statement. “Doing this safely and efficiently is going to require a foundational change in airspace management technologies.” That’s why Uber also announced it’s helping NASA develop its Unmanned Traffic System for Unmanned Aerial Systems. Hopefully they’ll have a snappier name by the time a system launches. It helps here to temper your expectations. Don’t expect this program to look like Uber’s ground service, at least not for a while. It’s likely the first flights will have to follow agreed-upon routes, like roads in the sky. They’ll be good for hopping all the way across town, but you’ll still have to get yourself the proverbial last mile to and from the takeoff and landing points. Those routes might run above freeway corridors to help with noise concerns (Holden has said electric aircraft should be quieter than your standard helicopter) and dodge the privacy concerns of rich folk who live near the Hollywood sign and don’t want every tourist-filled flying taxi taking a detour for a photo-op. The vehicles themselves aren’t finalized, but Uber is working with respected aerospace partners at Embraer, Bell Helicopter, Pipistrel, Aurora Flight Sciences, and Mooney Aviation. Experts agree that the technical challenges of building a drone capable of carrying passengers are crackable. New materials facilitate lightweight vehicles. Distributed electric propulsion—i.e., putting lots of rotors all over the place—makes vertical take off and landing possible, with less noise and pollution than a helicopter. Advanced computer controls make the vehicles easier to fly, and eventually should make them autonomous (though that brings up a fresh raft of regulatory concerns). There’s still a long way to go between a few demonstration flights, which can move maybe 20 people an hour from one side of a city to another, and a commercial service, which will have to move thousands to be cost efficient. Uber is proposing point-to-point transport from airpads, but as it scales up it will have to contend with aerial congestion from vehicles waiting to land, while passengers are still faffing around getting on and off the vehicle ahead. And it will have to consider traditional traffic congestion if there’s a line of cars waiting to pick up or drop off fliers to take them the final mile. San Francisco has just reached an agreement to allow Uber and Lyft to wait at some curbs. Hovering in the sky, with a dropping battery level, over a populated building, will be an order of magnitude harder to sort, but it helps that LA mayor Eric Garcetti says he’s supportive. The electric drones will also need to charge. Uber has signed an agreement with developer Sandstone Properties, which will install skyports on the roof of 20 of its buildings in the LA area, and says it expects more to follow. Until 2014, Los Angeles mandated all tall buildings have a heliport on their roof, for evacuations in fires or earthquakes. That led to LA’s famously dull and boxy skyline, but now the 70s-era rule may make the city a welcoming place for Uber and whatever competitors follow it into this future. Uber says that, one day, a zoom through the skies will cost the same as an UberX car trip does now, making access to the third dimension open to regular people, rather than the one percent who take helicopters to the Hamptons now. 2020 is just the target for demonstration flights, but the company says full commercial service should be up and running well before the 2028 Olympics arrive in LA. Until then, it’s something to dream about during your own daily battles with traffic.